Is there a better alternative to AirPort Flow? Is AirPort Flow really the best app in Network category? 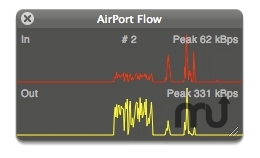 Will AirPort Flow work good on macOS 10.13.4? The rates are polled from the AirPort Extreme by SNMP. The top graph shows the incoming TCP traffic to the router and the lower one shows the outgoing TCP traffic from the router on a given interface. In the preferences one can set the IP Address of the router, an IF (interface) index value (2 is specific for the AirPort Extreme) and a so-called community password (public is default). Mac OS X 10.5 or later, AirPort Extreme with 'Allow SNMP' enabled (under 'Advanced' in AirPort Utility). AirPort Flow needs a rating. Be the first to rate this app and get the discussion started! [No SNMP response] is given when no response is received from the router. The router should have SNMP enabled. The IF index is added to monitor other interfaces on the router, 2 is the wireless part and 6 the WLAN port.